To find out what all the excitement was about Topretirements recently visited The Villages, located about 24 miles south of Ocala in north central Florida. After spending a few hours kicking the (golf cart!) tires, we came to one conclusion – Wow! That conclusion comes with one reservation – if your major hobby is staying home and watching TV, and you don’t like other people – skip The Villages. It will just make you feel bad that you are wasting all of the fun activities that you could be doing. The best way to get a quick idea of The Villages is to take their free 45 minute Trolley Tour. The lively tour is given by enthusiastic residents who will acquaint you with a broad sampling of the non-stop fun and resources available in this 5 by 12 mile community. To get to the tour just go east from I 75 and follow the signs for the Sales & Information Center. The Villages is proud to be family owned and operated, and benefits from intensive involvement from its residents. There are 2 town squares (Spanish Springs and Lake Sumter Landing) with shopping, restaurants, and open-air plazas featuring free nightly entertainment. It is in these plazas that all the big holidays are celebrated by the residents – including Mardi Gras, St. Patrick’s Day, and Cinco de Mayo. Sprinkled throughout The Villages are numerous shopping malls – virtually every big box chain in America is amply represented. From the trolley windows you will see all what keep its 100,000+ residents busy all day – having fun! There are 33 golf courses, 8 country clubs (residents automatically become members), along with plenty of (separate) family and adult recreational areas. The Polo Center and its Pavilion are busy throughout the year – you could take in an international polo match, or compete in a BBQ competition. There is virtually every kind of activity and athletic resource known to man: archery, one finger painting, pickle ball, quilting, scrap booking, synchronized swimming, taichi, yoga, etc. Dramatic and choral groups rehearse and perform in the giant Performing Arts Center. Two transportation Centers offer inexpensive and convenient transportation to the Orlando Airport. A network of golf cart/bike/jogging paths winds completely through the community – and it is such a ubiquitous transport form that many couples are owners of 2 golf carts! There are also 9 churches, VA clinic, pet hospital, a daily newspaper, elementary through high school, and a radio station – among other resources too numerous to mention. Housing choices are one of the odd things about The Villages, which betrays it roots as a manufactured home community. Although there are many styles and sizes to choose from, single family homes are the only housing choice (there are a few villas – attached homes). There are no apartments or condos. The Villages’ assisted living component, Homewood, is growing rapidly and provides the security that residents will never have to move from The Villages. Homewood is across the street from The Villages Hospital, the largest medical facility in this part of Florida. Home sales are brisk here. Prospects, buyers, and renters streamed in and out of the Sales Center. So, if you like to be really active and want to live in Florida fairly inexpensively – The Villages just might be for you. You can even come down and rent for a few days fairly inexpensively, which is a great way to see for yourself. 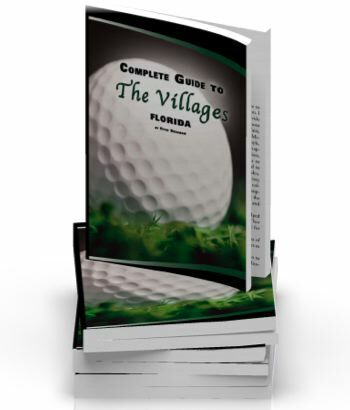 "Inside the Bubble: Unauthorized Guide to Florida's Most Popular Community"